In a world obsessed with technology and social media, is it a surprise that one can now set up a drug deal through social media? Teens obtaining drugs through Instagram is the new craze. 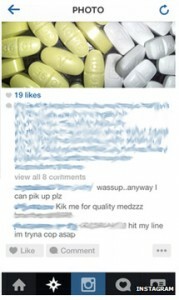 Yes, drug dealers are becoming that bold.Instagram is a social media site used to display pictures and videos with captions. No lengthy information or posts, like Facebook. It is short and to the point. Instagram also allows users to share their pictures and videos to other social media sites, like Facebook, Twitter, and Flickr. Anyone can make an account and your privacy can be kept at a very high level. Hence the attraction drug dealers have with this new form of selling drugs. They can market their drugs across several social platforms and keep their anonymity.So how does this work? It is pretty simple. A teen looking to obtain some drugs, simply types in a search for them. If they are looking for marijuana, they simply type #marijuana. The search will then display all the pictures with that hashtag, as well as the user attached to the picture. From there, the teens can message the user and set up a place to meet. Users can also get more specific buy typing in a drug and location. For example, if you are looking for Xanax in Chicago, you can type in #xanaxchicago. “It’s just a lot easier. You’ve got a picture of it right there, you just hit them up,” says a 17-year-old informant.Instagram has been very active in trying to stop these incidents from happening, but when you promoted anonymity; it is very hard to combat this problem. You can report user’s pictures and Instragram will ban them from using the site. Anonymity again is the problem. Sure you can ban that user and their email address. The problem is that they can get a new email address and create a new user name and profile. It is a vicious cycle.Authorities are claiming this is a new trend among teens, but how long will it be before it becomes a trend among the entire population? Will this new craze cause Instagram to close down or reconfigure the privacy policies? Either way, drug dealers will find a way around it. The best action to take is to monitor your teen’s online activities and who they hang out with.